It's time for your annual dose of free queso from the Mexican fast-casual restaurant that is not, in fact, named after your favorite member of the Three Stooges. For the eighth straight year, Moe's Southwest Grill is thanking burrito-lovers all across the country with Free Queso Day on Thursday. To grab your free queso on September 20 do basically nothing except stop at your local Moe's location. Everyone who stops in can grab a free six-ounce cup o' queso and a basket of warm tortilla chips. 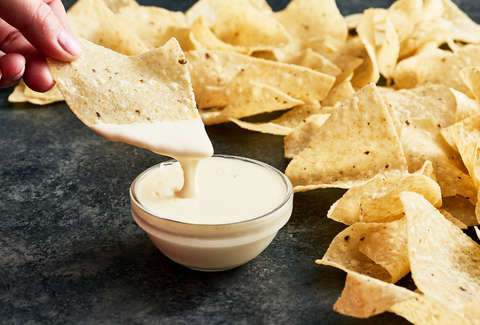 Moe's describes its queso as "liquid white gold." It's made with a blend of three all-natural cheeses and diced jalapeños for a bit of a kick. At Moe's locations in New York City, a cup of queso will generally set you back a little more than four bucks, though prices likely vary from region to region. In any case, getting some for free is a decent savings on your lunch bill. "Last year at Moe’s, we delighted fans when we gave hundreds of thousands of cups of free queso across the country," said Bruce Schroder, president of Moe’s. "Free Queso Day is our favorite day of the year because it gives us the opportunity to say thank you to all of our loyal fans and what better way to do so than with a free cup of our fan-favorite liquid gold." The cheese celebration got a big boost last year, landing near Chipotle's attempt to insert queso into its menu. That effort was met with criticism from fans who were not fans of the queso, which some said tasted grainy and like "expired Velveeta."